I’ve spent some time making a few modifications to the groundhog kiln and am ready to try it out. A bag wall or baffle was placed in the rear of the kiln, creating a small chamber. The idea is to cut down on the smoke a bit, maybe even out temperatures some. Also, a cast refractory damper was installed in the chimney for better control of firing conditions. I hope the Augusta Fire Dept. Station 2 appreciates the extra sleep they’ll be getting now! We’ve also laid in quite a bit of wood. Much of it is still green and needs to dry for another 5 months or so. We’ve been cutting and hauling lots of pine slabs from the local sawmill. Owner David Ennis also lined me up with a new 18 inch chainsaw. It cuts through the mountains of wood like they were butter! It means a lot to us to recycle or use waste in firing the kiln. 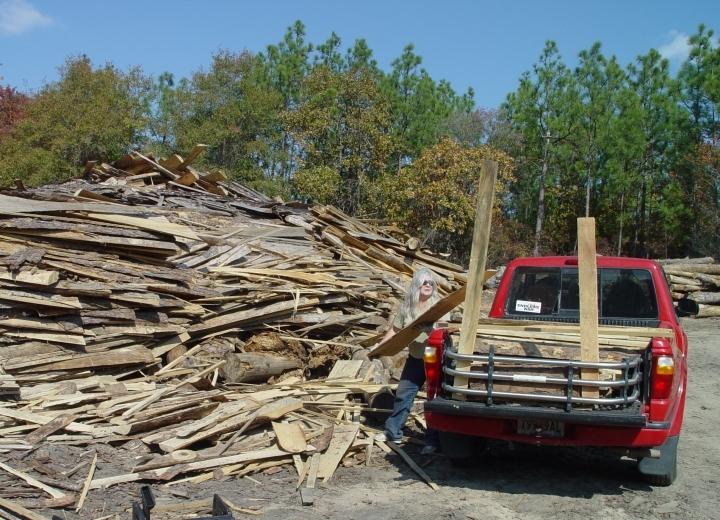 I can honestly say that 99.99% of wood burned is scavenged from sources that would otherwise discard it into landfills or ignite it to no purpose. 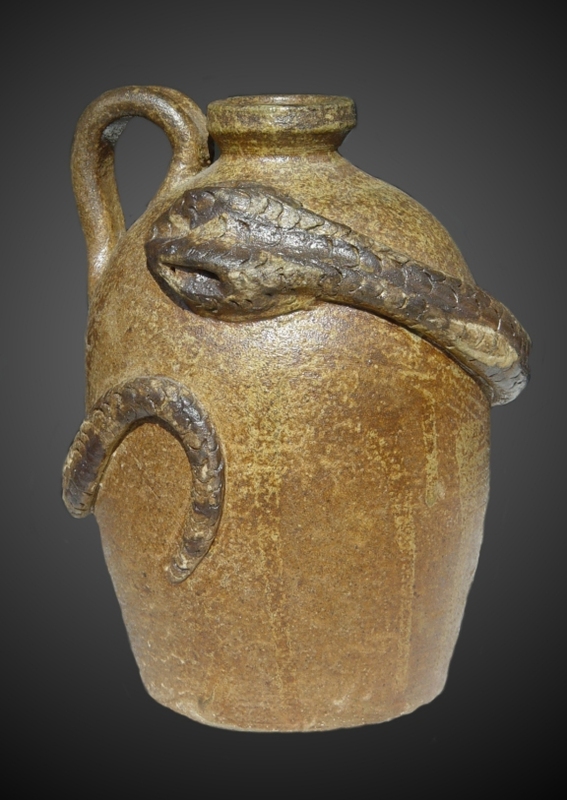 Recently, I came upon a snake jug I’d made many years ago. It felt like running into an old friend. I forget the many pieces I’ve made through the years, but always enjoy coming across them and I enjoy the esteem the owner holds it in. I guess in a way, these pieces from the past serve as somewhat of a report card for me or a marker of progress on this pottery journey I travel. I sometimes blush at old handles or jug lips. Often, it’s the sheer weight that causes a brief wince. But, hey, that’s what self-taught is all about. I love each and every one of them for the joy they brought creating them and am honored they reside proudly on mantles, tables and prominent shelves in their owners house and in their hearts as well. This method of pottery making is so labor intensive! All tasks are just as important to the final pot as is the actual turning on the potter’s wheel. Digging and blending the proper clay or cutting and stacking seasoned wood of the correct size, both are just as important as skillfully turning the pot. As a matter of fact, I might have to say the firing process even out-ranks all of the others in importance, for a mistake here cancels out all other efforts at bringing the pot to life. Again, I become irate when I see others calling or describing their work as “Old Edgefield” or “Old Edgefield-Style” when they simply make pots like they do anywhere and fire them in an electric or gas kiln. They compete directly with me but have only a fraction of the work and effort that I must put into my pottery in order for me to use the word “Edgefield” in describing my art. My past posts show I’m a tireless crusader against those who are being untruthful in the representation of their work. It’s so easy to tack the Edgefield word on to your pottery description and deceive buyers. However, ceramic historians and market prices will eventually relegate them to their appropriate level of status. 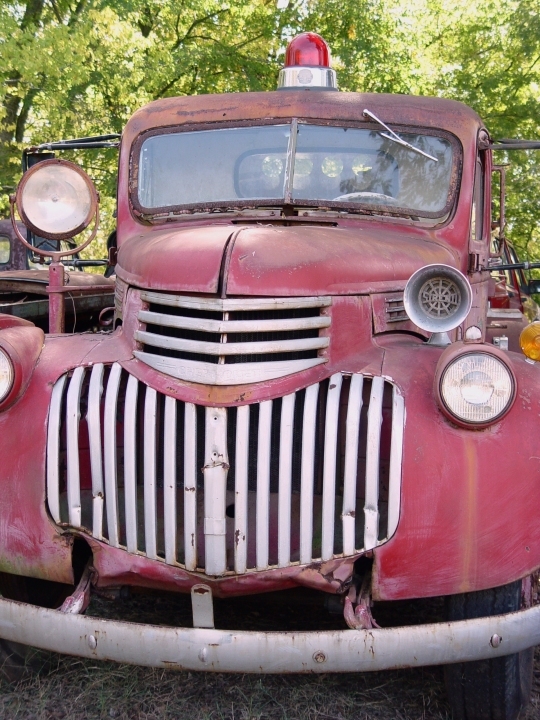 I do commend potter Gregg Patton for his eBay sales where he describes his work as “Edgefield-Inspired”. I like that term for work made with modern methods. I’m proud to now have my work available at two new locations. In addition to the Augusta Canal Authority Museum, it is available in downtown Edgefield, SC in the SC National Heritage Corridor Center and Museum and at the Morris Museum of Art giftshop in downtown Augusta, GA. Thanks again to all who’ve supported me through purchases or other means and enable me to continue this tradition and important part of southern heritage!